Represent your favorite local brewery with shirts and other merchandise from Moylan's. Most items are available on-site at the brewery, or via online ordering. We'll ship your merchandise order right to your door! Choose from $25, $40, $50, $75 and $100 gift cards. 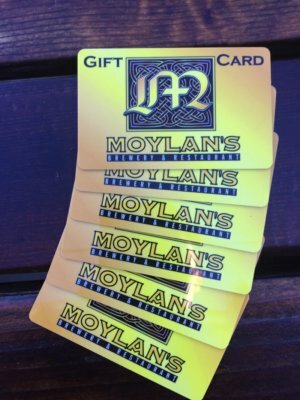 Subscribe to our email newsletter to recieve Moylan's updates and special offers. ©2019 Moylan's Brewery & Restaurant. All Rights Reserved. Website by Swish.